Team Kenya kicked off the African Nations Cup in style as the men’s draw got underway at the Nairobi Club and Public Service Club. Kenya’s number one and sixth seed Ismael Changawa Mzai was on court against Ethipia’s Abdella Nedim Mohamed when the championships started. Changawa, a much superior player to the Kenyan based Ethiopian found himself in a topsy turvy affair in a match he should easily win - on paper. The two traded service games until 3-3 in the opening set when Changawa got the decisive break. Changawa went on to consolidate his break to lead 5-3 and lose only a single game thereafter to close out the opener 6-4. The second set saw Changawa dominate proceedings after dropping the initial game to Nedim. He went on a four game streak to stand at 4-1 before a lapse in concentration got Nedim back into the match with three consecutive games to level matters at 4-4. Changawa however held his mettle to close out the set and the match 6-4 6-4 to proceed to the second round. Tuesday sees the start for the women's category with Faith Nyabera, Paige Mbugua, Katarina Karanja and Shufaa Changawa set to fly the flag for Kenya. After Changawa’s win, three more of the Kenyan men were to get on court with Petty Andanda dominant over Rwanda’s Fabrice Tuyishime, beating the Rwandese 6-4 6-2. Kevin Cheruiyot was also a victor over Ivory Coast’s Yorick Michel Amon in two straight sets 6-2 6-1. 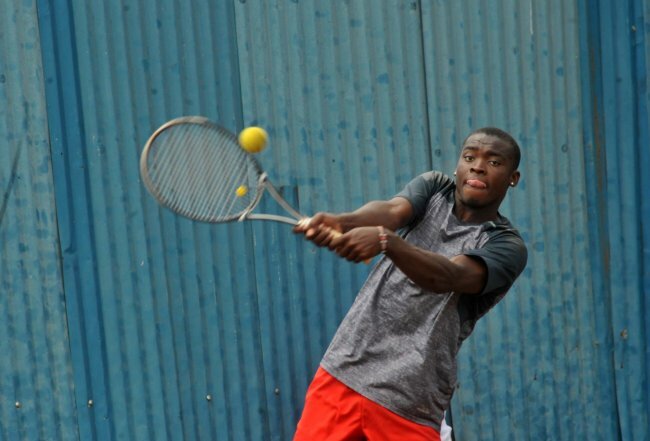 Florida-based Maurice Wamukowa was the single casualty on the Kenyan team with a hard fighting Wamukowa going down to Sudan’s Noor Rushdi in a 3-6 6-3 6-4 contest. Currently, Kenya’s Ibrahim Kibet Yego is on court against Tunisia’s Mohamed Ali Bellalouna with Sheil Kotecha to close out the home nation’s Singles matches with Doubles to follow.